When preparing your grill packets, it's best to have everything together and ready to assemble. For this packet, we have a nice 6-ounce piece of halibut cut into a square. Season the fish, top with onions and peppers, and drizzle with a flavorful butter sauce. So here we have all our ingredients and several sheets of aluminum foil. The foil pieces should be large enough to fold over and completely encase the halibut. Make sure to create an airtight packet to hold in the flavor. 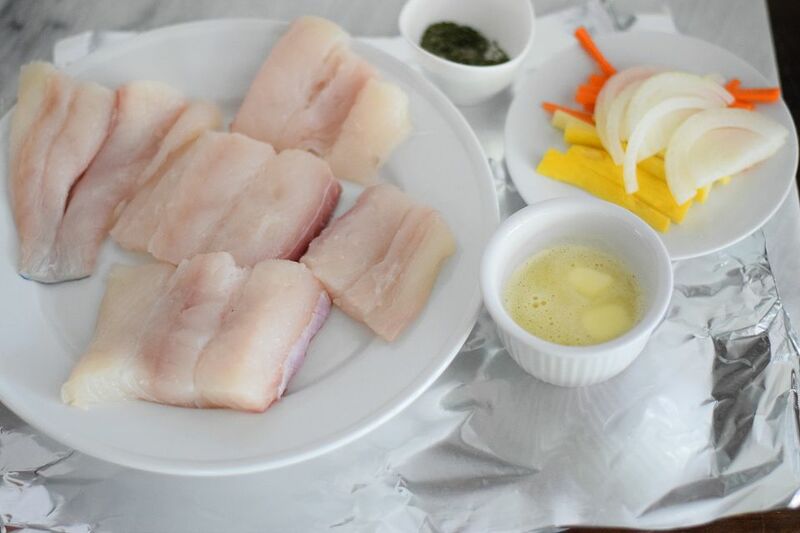 Remember that a packet is enclosed and that the seasonings will be staying in with the fish and not draining as it would if you were just open grilling. So keep the seasonings on the light side, but definitely season the fish. The great thing about grilling packets is that you can add your favorite ingredients, like onions and green bell peppers. Like kebabs you want to include vegetables that will cook up in about the same time as the meat you are using. Despite the fact that the packets are sealed and that all the moisture from the fish is being held inside, it still needs extra moisture. It is this moisture that is going to steam the food all the way through. This steam evenly distributes the heat and makes your packet an efficient cooking machine. Try a simple mixture like lemon juice, melted butter, garlic, oregano and a little white wine. Bring up the opposite sides of the sheet of aluminum foil to meet in the center. Press them together at the top and roll (or fold) down until you reach the food. You want the packet to be tight, but make sure not to overdo it. Now flip the packet over and fold the ends up and over the packet until you have a nice, neat little square that is watertight (or nearly so). Grilling packets is easy, but not foolproof. You can burn what's inside if you are not careful. Typically the foil will scorch when the food inside burns. To grill the packets turn up the heat to medium-high and place them on the grill. You will need to cook the packets about 5 to 7 minutes per side. You should take care when handling the hot packets. Part of the secret to getting them perfect is not to puncture the packet. A gentle (not pointy) pair of tongs is perfect for turning, moving, and removing the packets on your grill. Once the packets are done (about 5 to 7 minutes per side for fish packets), remove them from the grill. Because the packets are sealed, the heat will stay inside so you don't need to worry about this cooling off too quickly. In fact, they will continue to cook off the grill so don't let them sit for too long. Water in liquid form will raise no more than the temperature of boiling. Steam can be hundreds of degrees more. When opening your grilling packets it is important that you are very careful to let the steam escape before you start digging in. Do serve grill packets to your liking, but release the steam before presenting them to your family or guests. Plate your beautiful fish and vegetables and serve!